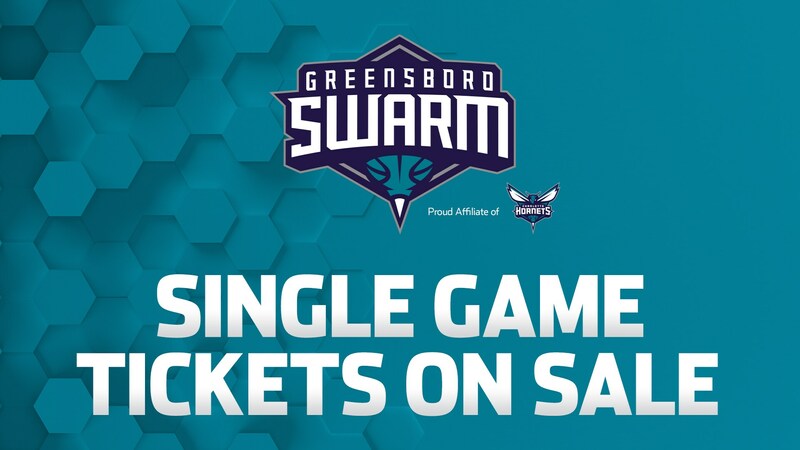 The Greensboro Swarm, the NBA G League affiliate of the Charlotte Hornets, announced today that single-game tickets for the 2018-19 season are now on sale. Tickets for home games the Fieldhouse can be purchased at gsoswarm.com, ticketmaster.com or at the Greensboro Coliseum Complex Box Office. The Swarm have 14 of its 24 home games on a Friday or Saturday during the upcoming season, including the home opener on Saturday, November 10, against the Detroit Pistons’ affiliate, the Grand Rapids Drive at 7 p.m.
Single-game tickets can be purchased for as low as $9 per ticket for baseline bleacher seats, the lowest price in the history of the organization. An additional 50 percent discount for military and college students can lower the cost to $4.50 per ticket. The first annual School Day Game (December 12) is sold out but fans can purchase their seats for the remaining 23 games. This season the Swarm will play an afternoon matinee on Martin Luther King Jr. Day (January 21). The defending G League Champions, the Austin Spurs (San Antonio Spurs affiliate), visit the Fieldhouse on November 21. Greensboro is a member of the NBA G League’s Eastern Conference in the Southeast Division, along with the Erie BayHawks (Atlanta Hawks), Lakeland Magic (Orlando Magic) and Capital City Go-Go (Washington Wizards). The entire 2018-19 schedule, along with links to purchase tickets, can be found here. A promotional schedule will be announced at a later date.